You cannot reproduce any copyrighted material by our authors without express written permission to do so. If you would like to use any copyrighted material from one of our authors you will need to email us with as much detail about your publication as possible, including details of the publisher, the extent of the quotation, the title from this the material is derived and the publication date. Please request the permission with plenty of time before publication as the permission proceedure can take up to two months to process. 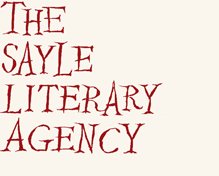 Please send all the relevant material to info@sayleliteraryagency.com.